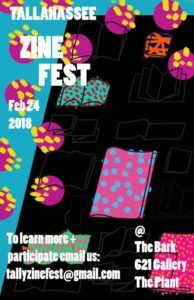 Tallahazine Fest 2018 will take place on Saturday, February 24th from 12-4 PM. This is an opportunity for the Tallahassee community to come and check out accessible, self-published books, zines, and printed ephemera! Some will be available for purchase, some for free! At The Bark, 621 Gallery, and The Plant! Local makers can sign up to table! We will have a table for our long-distance zine friends, too, donations only, not for sale. We ask that all participants donate 1 zine to the 621 Zine Library. Costs of zines are at the makers’ discretion! Want to volunteer? We want you to volunteer! Let us know!